Finally, hunters can buy a silicone wedding ring that can handle the elements. Hunting in a wedding ring can be dicey, as it can lead to a gruesome ring avulsion accident like this. However, no one wants to have to take off his or her ring for every trip into the woods. Even for those who hike, camp, and regularly work with their hands, a normal metal wedding ring could spell disaster. Fortunately, there's now an easy solution to the traditional gold or silver. There are a number of brands out there that offer active individuals the sleek option of wearing a silicone wedding ring. Not only are these nonconductive rings practical for anyone who frequently puts their hands to work, but they have a unique look, too. Most of these silicone rings come in a wide variety of colors and styles. Which fits your active outdoor lifestyle the best? ThunderFit Rings come with an exclusive manufacturer warranty and they boast top-grade silicone. These rings are particularly plain, but that's what's so great about them. Each of these colors will go with just about anything, and they'll look just as good on a woman as they will on a man. 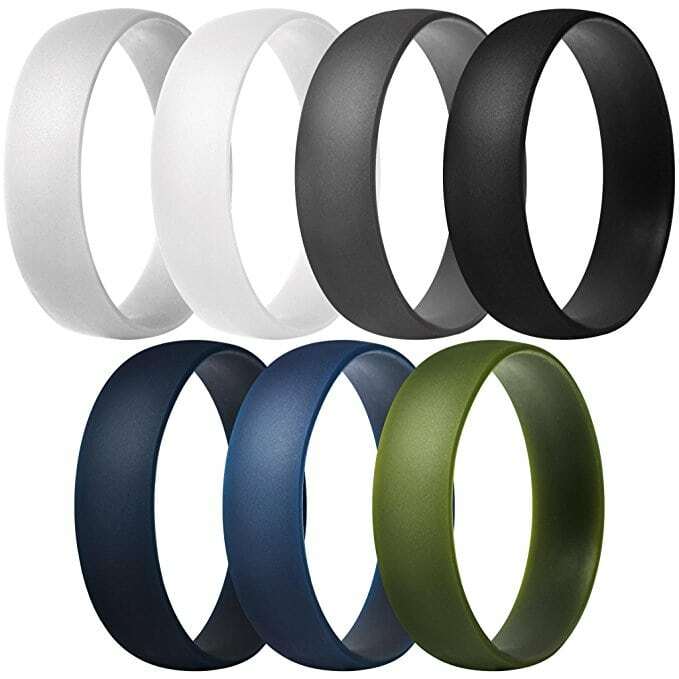 As you can see in the photo above, these rubber wedding bands come in silver, white, dark gray, black, navy, blue and what looks like olive drab green. These Made For Her women's silicone, stackable wedding rings are ideal for those hitting the woods or the water for some action in the great outdoors. They won't have to worry about damaging their fine jewelry, and they'll also be worry-free when it comes to possible accidents. They also come with a lifetime warranty, so you're set forever. These are some of the more unique silicone wedding bands out there. These F4119 rings are very similar to the ThunderFit ones, but they feature a few different color options. More specifically, this one comes in pink for the ladies, a unique red color, and plain gold, which would be perfect for anyone who wants to maintain the look of a traditional wedding ring with a gold or metal band. If you're considering wearing something besides your metal ring when you're getting busy with your regularly active lifestyle, would any of these fit the bill?